Dr. Al-Waziri, secretary general of the Supreme Council of Antiquities told reporters yesterday that the tomb’s paintings depict “the goddess Hetpet observing different hunting and fishing scenes, a monkey collecting fruit…another dancing in front of an orchestra.” The tomb also contained a purification basin in which Dr Al-Waziri said are “engraved the name of the tomb’s owner and her titles,” as was reported by a report in The Times. Created around 2500 BC, The Pyramid of Khufu in the Giza complex in Egypt is the largest and most famous ancient stone tomb in the world. However, in its shadow, hundreds of lavish tombs and burial chambers contain the remains and treasures of important priests and priestesses and high-ranking officials. The Egyptian ministry told reporters that the tomb “has the architectural style and the decorative elements of the Fifth Dynasty, with an entrance leading to an 'L' shaped shrine”. And that’s all folks! Really, that is all. I decided to ask a couple of questions that not a single one of the hundreds of reporters who have covered this story has yet asked. Why is this tomb L-shaped? And, what do the “unusual and rare” monkey paintings represent? Adding all this up, we now know that this newly discovered “L-Shaped tomb” reflects an architectural style that was used at least 200 years prior to its construction, and, in the writing the name and titles on a stone, it is evident that similar sacred dynamics, otherworldly beliefs and superstitions were also consistent with those held two centuries previously. Concerning the “unusual and rare” wall paintings, “in Egyptian literature it is recorded that certain elements within the burial rites were considered to be of such importance that they were sometimes depicted on the walls of the chapel or tomb” said Roeten. Thus, we now know that the “monkey collecting fruits” served a functional role in the perceived afterlife journey of the priestess of Hathor, to whom the tomb was dedicated. The monkey symbolically collected fruits so to constantly feed the deceased soul. Thus, this tomb is an ancient, interactive, full-color manual of the mythologies of Hathor in the afterlife. Following the paintings in this L-Shaped tomb, in the correct fashion, will allow us to retrace the steps of an ancient ritual last performed over 4400 years ago, before being locked in time. Pilsbury Alcock, J. Food in the Ancient World, Greenwood Publishing Group, 2006. 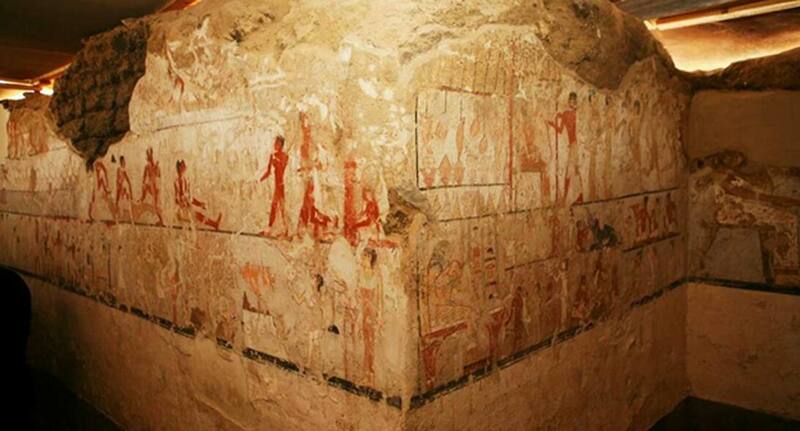 Roeten, L. H. (Prof) The Decoration on the Cult Chapel Walls of the Old Kingdom Tombs at Giza, BRILL, Jan 9, 2014.